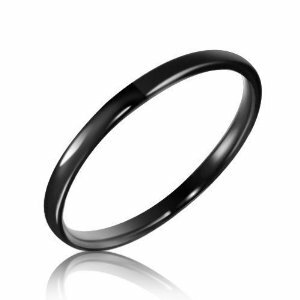 This 2mm Black Tungsten Rings is great for the Ladies! Tungsten can be heavy, this is not. Slim, Sleek look for great addition to your jewelery collection. This tungsten ring is guaranteed for life to never tarnish, scratch, bend or chip. Ever. The Soffi comes in a free black velvet box and free shipping! Q: This ring is so thin, can we still have it engraved on? A: You sure can! The engraving looks great on this ring. Happy Shopping! Was this answer helpful? 12 of 15 Customer(s) found this Answer helpful. Q: I am guessing on the size - so can this ring be resized if required ? I am very pleased with my purchase. It's exactly what I was hoping for. I wanted something simple and elegant that I can always wear. I'm recently widowed and when the time comes that I'm ready to stop wearing black, I will put on my beautiful black band. It's perfect. Thank you. I got this to match the another one on this site as me and my husbands wedding bands. I love these rings. they are very nice looking. hides scratches, fits well. I highly recommend. Great looking piece of jewelry. The ring reflects quality and substance... Beautiful. This ring is perfect for a stylish statement that does not overpower your finger or make you feel gaudy. Previously, I wore an 8mm tungsten ring that I felt was too big for my fingers. Then I purchased this 2mm ring and have received more compliments than ever before! Perfect ring for a stylish yet subtle statement. Love it! I'm VERY please with this ring and I like the fast, reliable delivery. This ring is elegantly simple and yet so stylish. Dressy. I love it. Perfect, very comfortable, fast shipping to Canada, thank you ! Gorgeous! This was my ring when my husband and I renewed our vows. Perfect! Originally purchased a ring that was too big. Exchanged it for the correct size and the Soffi Black Domed Tungsten Ring. The exchange was a MUCH smoother process than expected. I certainly would purchase more products from this company. Tip: Get your finger(s) sized at a jeweler prior to ordering. The Tungsten 'ring sizer' is not that reliable, but the rings are super! Very nice ring. Fits good. I love it! Will be ordering more! Love the ring, it goes along with my gold band perfectly. Arrived in a timely manner with no hassles. Would purchase again from this company.